Venice is, of course, a wonderful place to visit. But running in Venice? One would think that between the maze-like layout of narrow, cobblestoned streets and the crowds, it would be difficult to find a good place to run in Venice. But, surprise, there are actually some good spots — you just have to know where to go! The best places to run in Venice tend to be along the water: the paths are wider, more seamless, and the views are great. 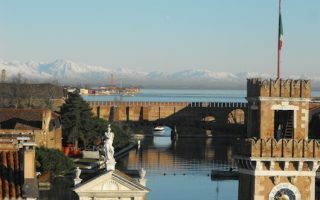 Three choice spots are Riva dei Schiavoni to the Giardini (gardens), and adjoining Sant’Elena area, Zattere, and Fondamente Nuove. 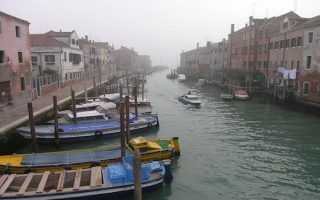 Giudecca, the Lido, and Burano, all islands on the Venetian lagoon and easily reachable by Vaporetto, offer good waterside running with fewer crowds. 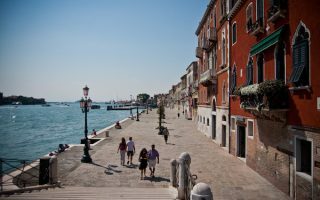 As for running the interior part of Venice, we wouldn’t hazard to design a route, but if you go early or during non-crowded times, you can get yourself pleasantly lost in a stroll/run–. even doing a few laps around some of the larger squares! For the main part of Venice, it’s best to run early to beat the crowds. Also, be aware of the heat in summer and occasional street flooding in any season. For getting around Venice, on the island you’ll be relying a lot on your feet. The Vaporetto water bus system and ferries are the main form of transport, which can be used creatively for one-way runs and to access neighboring islands. We've scoped out some of the best places to run in Mestre, the gateway into Venice for many. There's San Giuliano Park and some pleasant streets. 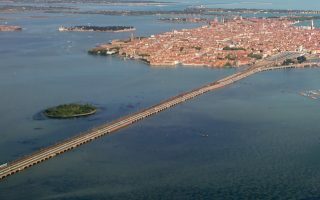 One CAN run into Venice, on the Ponte della Libertà, 8 km one-way. Go early and take the train back! 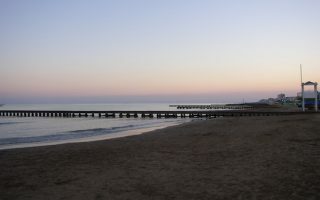 A wonderful along route along the water, easily accessible from San Marco. Includes a tour of the Giardini (Biennial Gardens), quieter paths of Sant’ Elena island, for a 7 km out and back. Optional 1.5 km San Pietro add-on. 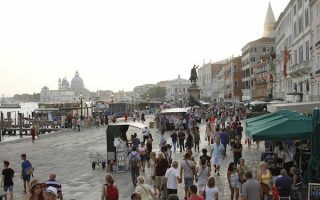 Running along the Zatterre offers a relatively short, easy out and back along the water to the Santa Maria della Salute and its marvelous steps. Most of the route is along a wide path. A relatively seamless 5.3 km out and back in the Cannareggio area, on Venice's north side. Good water views out to Murano. The Fondamente Nuove is wide enough for easy running. Turn around at Torre dell'Arsenale. A pleasant and less crowded run along the water on the island of Giudecca, facing the Zaterre and San Marco. Great views of the water and Venice. 4 km out and back along the water, or 6.5 km with loop of the Sacca Fisola. Barrier island a 15-minute ferry ride from Venice offers nearly 15 km of running, much of it along the water with separate paths. The beach is also runnable. Good opportunity to uncork away from the hordes in Venice. 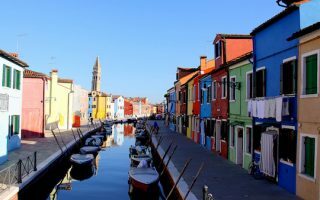 A 40-minute ferry ride from Venice to the far northern end of the Venetian Lagoon, the island is known for its brightly colored houses, artists, and lace work. We’ve designed a ‘runseeing’ tour of the main sites of Burano, with a jaunt over to Mazzorbo. 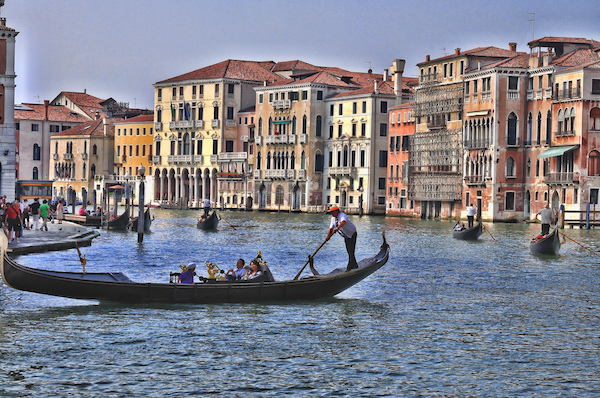 Venice has a Humid subtropical climate, with cool winters and very warm summers. Average July high temperatures are in the low 80sF (27C), with humid days and warm nights. In winter, average high temperatures are in the 40s (6C), with lows around the freezing mark. Venice averages about 30 inches of rain annually, more in summer than winter. There are three running-centric stores in Venice. Venice Sport Shop. Great running store and home to the Running Club Venezia. FREE group runs Monday, Wednesday and Friday morning at 6.30 from Calatrava Bridge and every Thursday evening at 19.25 from The Venice Sportshop, their store. Changing rooms and a place to leave your bags! Further info: 39 327 9129439. Essetre Sport. Located in Mestre, outside Venice. Venice by Run. Paid, guided running tours, as well as numerous running events. Garmin Venice by Night Trail. April. 3,000 people running a 16k race at night! Venice Marathon. October. Some on Venice but also surrounding area.